The long Finnish winter is coming to an end, as evidenced by the mid-April sun melting the last patches of snow at the Tuulispää shelter. Ieku the white beef is taking advantage of this warmth to take a sunbath. Around him, cows and sheep are doing the same while in the background a silhouette is holding a rake, working and scratching a sheep once in a while. This is Piia, the young founder of this special refuge located one hour and a half drive from Helsinki. In this shelter, no wild animals, but sixty farm animals who spend a peaceful retirement thanks to the constant care of Piia and volunteers who support her throughout the year. Horses, goats, ducks, pigs, geese, sheep, cows, rabbits share the big estate. There are even two arctic foxes escaped from one of the country's 900 fur farms. According to Niina, the arctic fox volunteer, Finland is the country where the most fur is produced from arctic foxes. The two lucky foxes who have been able to escape a life of suffering wouldn’t be released in nature, because they are unable to survive alone. 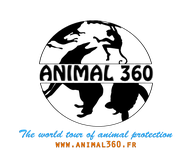 The goal of Piia is broader than the simple rescue of these animals: her mission is to raise awareness of the public regarding animal welfare and veganism. That is why, with the help of volunteers, she regularly organizes open houses to allow visitors to discover farm animals while sharing a good vegan meal. Indeed, a lot of people have never been around farm animals, and according to Piia it is one of the brakes to the development of the vegan cause. Volunteers are welcome to take care of the shelter's many daily tasks such as cleaning enclosures, brushing horses, food tours and various maintenance work. The center only works through donations. Each animal can be sponsored. To follow the activity of the center and support its action, you can go on the website by clicking here. You can follow their Facebook page by clicking here.